A religious drama and comedy, Come To The Stable celebrates the impenetrable power of faith with a wink and a smile. New England, shortly after the end of World War Two. French nuns Sister Margaret (Loretta Young) and Sister Scholastica (Celeste Holm) arrive to the small town of Bethlehem in search of land and money to build a children's hospital. Margaret made a promise to build the facility after American troops avoided damaging the French hospital where she worked during the Normandy landings. 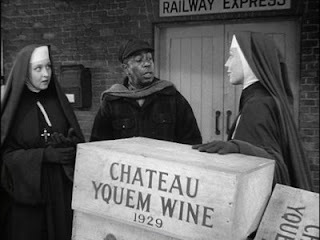 The nuns take up residence at the simple home of dotty religious artist Amelia Potts (Elsa Lanchester), but face numerous obstacles to their plans. The idyllic hill top parcel the nuns set their eyes on is owned by New York City mobster Luigi Rossi (Thomas Gomez). Local land owner and celebrated songwriter Robert Masen (Hugh Marlowe) at first appears supportive but becomes opposed to having a hospital in his quiet neighbourhood. Even the local Bishop (Basil Ruysdael) is skeptical. But Sisters Margaret and Scholastica are nothing if not persistent, and they set about to make their far-fetched dream a reality. Directed by Henry Koster and inspired by a true story, Come To The Stable finds the right tone for its message. Delivering an affirmation of belief with a light touch, the film provides a steady drip of self-deprecatory humour to keep the more dramatic moments in check. The outcome is an experience that undoubtedly salutes good religious intentions, but within a pragmatic context. Koster achieves a couple of memorable highlights. Margaret and Scholastica blithely march into the headquarters of crime boss Luigi Rossi in New York City, and persevere despite the dismissiveness of first his henchmen and then Rossi himself. The French nuns and the Italian-American gangster finally break the barriers between them by finding an unexpected common bond. The theme is cleverly amplified with songwriter Robert Masen. Initially helpful but gradually more resistant to the nuns' project, Masen will also awaken to the unlikely connection between his music and the battlefields of Europe. The performances match the film's attitude. Loretta Young stays within herself and allows the mission to march ahead of the character. Celeste Holm is even more reserved but gets a wacky moment to shine on the tennis courts. Hugh Marlowe leads a steady supporting cast, with Koster animating the local community with plenty of life and avoiding most of the obvious maudlin traps. Come To The Stable wraps up in an efficient 94 minutes, the French nuns' perfectly executed friendly invasion of New England a small but worthwhile echo of a distant war. You were a lot nicer to this than I was. Admittedly, films with this dedicated a religious theme have an uphill battle with me, but I thought there was a lot of schmaltz in this. Worse, everything that happens is pretty clearly telegraphed, so there was nothing here that was even mildly surprising. I agree - no surprises, but I enjoyed how perfectly the film delivered on exactly what it set out to do.